This meal was made with ingredients from the farm. My mum threw it together for lunch. After mopping every last morsel and as I had the pleasure of doing almost every day, I lay down and read my novel, Sea of Poppies, until passing out in the midday heat. Again, the fresh ingredients made the dish. Chop the garlic and fry in olive oil. Add the sliced marrows and fry with the juice of half a lemon. Add the tomato and let it cook with the lid on. Slice the spring onion, tomatoes and cucumbers and wash the greens. The spring onions are super strong in Cyprus so you don’t need much to give the salad a good bite. Chop the feta. Splash with olive oil, lemon juice and a bit of balsamic vinegar. Serve with the bougouri and a good dollop of full cream Greek yoghurt. Vegan version: leave the yoghurt. 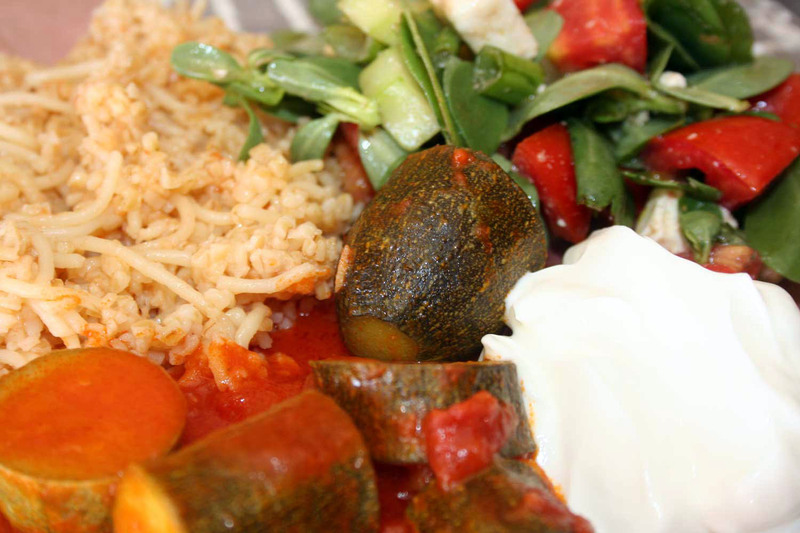 This entry was posted in meal, Salad and tagged baby marrow, bougouri, cypriot, garlic, lemon, tomato, vegan version, yoghurt. Bookmark the permalink. It is a bulgar wheat dish.